Maxillopoda is a diverse class of crustaceans which includes the barnacles, copepods and a number of related animals. It does not appear to be a monophyletic group, and no single character unites all the members. With the exception of some barnacles, maxillopodans are mostly small, including the smallest known arthropod, Stygotantulus stocki. They often have short bodies, with the abdomen reduced in size, and generally lacking any appendages  This may have arisen through paedomorphosis. Apart from barnacles, which use their legs for filter feeding, most maxillopodans feed with their maxillae. Their bodyplan has 5 head segments, 6 thoracic segments and 4 abdominal segments, followed by a telson (tailpiece). The fossil record of the group extends back into the Cambrian, with fossils of barnacles and tongue worms known from that period. Six subclasses are generally recognised, although many works have included the ostracods among the Maxillopoda. 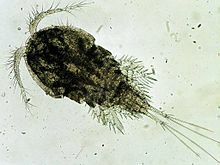 Of the six groups, only Mystacocarida are entirely free-living; all the members of the Tantulocarida, Pentastomida and Branchiura are parasitic, and many of the Copepoda and Thecostraca are parasites. Wikimedia Commons has media related to Maxillopoda. ↑ "Maxillopoda". Integrated Taxonomic Information System. Retrieved October 7, 2010. ↑ 2.0 2.1 2.2 Joel W. Martin & George E. Davis (2001). An updated classification of the Recent Crustacea (PDF). Natural History Museum of Los Angeles County. p. 132. ↑ 3.0 3.1 3.2 "Introduction to Maxillopoda". University of California, Berkeley. Retrieved December 31, 2009. ↑ Phil Myers (2001). ""Maxillopoda"". Animal Diversity Web. Retrieved December 31, 2009. ↑ B.A. Foster & J.S. Buckeridge (1987). "Barnacle palaeontology". In A.J. Southward. Crustacean Issues 5: Barnacle biology. pp. 41–63. ISBN 90-6191-628-3. ↑ Dieter Waloszek, John E. Repetski & Andreas Maas (2005). "A new Late Cambrian pentastomid and a review of the relationships of this parasitic group". Transactions of the Royal Society of Edinburgh: Earth Sciences 96: 163–176. doi:10.1017/S0263593300001280. This page was last changed on 19 February 2017, at 19:51.